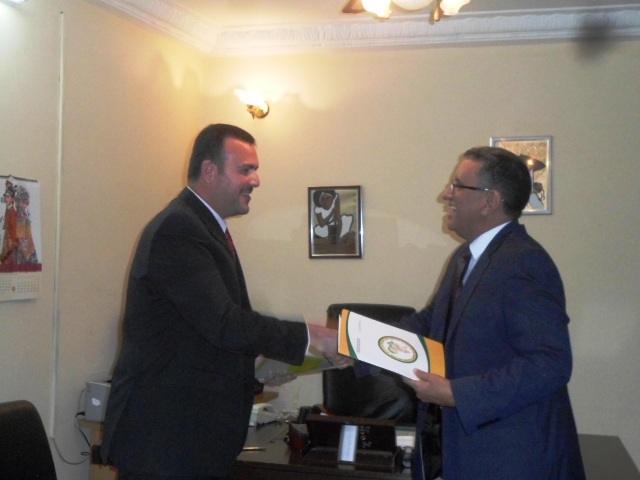 The Africa-Arab Cultural Institute (AACI) and the Al Hakim Foundation of Iraq signed, on Saturday, December 8, 2018 at the ICAA headquarters in Bamako, a memorandum of understanding of cooperation. Through this document, both parties undertake to cooperate in the field of organization of conferences and symposia to enhance mutual understanding between the African and Arab peoples in the promotion of their respective cultures, the fight against violent extremism, the radicalization of thoughts, the granting of scholarships and the exchange of university professors. The agreement was signed on the ICAA side by its Director General Dr Mohamed Salem SOUFI and on the side of the Al-Hakim Foundation of Iraq by Mr. Mohamed Turki JASEM. In his speech, Dr Mohamed Salem SOUFI, Director General of the AACI reminded that the main mission of AACI is to build a bridge between Africa and the Arab world through strengthening cooperation in the fields of art, culture, science, education and so on. For his part, the Representative of the Al-Hakim Foundation of Iraq, Mr. Mohamed Turki JASEM recalled that his country had withdrawn somewhat from the African scene because of the problems caused by the war unleashed in 2002. But today this page is about to be turned and Iraq is ready to resume cooperation with all the countries in Africa. ICAA hosted a dinner at the Director General’s residence in honour of the illustrious guest, which was attended by Malian dignitaries and intellectuals and men from the media.